Asking your boss for your career break is the moment when your plans get serious. Once the idea is out there, theres no going back or pretending you were joking about it, so its important to think things through before you air your plans publicly. Have a strategy for getting them to say Yes, and a Plan B in case they dont. Raising the subject of a sabbatical or career break is a tricky one. Your first step is to probably ask around and see if anyone else has done it. If so, are they are still around? Ask them how they managed it! Larger companies may actually have an official written career break policy, which you can find in the company handbook, or website. "Sound out the boss indirectly first, raise the topic, if the response is positive, follow up with a sabbatical request." For places without an official policy, Rachel Morgan-Trimmer of The Career Break Site (www.thecareerbreaksite.com) recommends sounding out the boss indirectly first  perhaps raising the topic without specifically saying that you want a sabbatical. If the response is positive, follow it up with a sabbatical request. Rachel comments that she has come across many cases where people have got a sabbatical where there was no official policy, so its always worth asking! Many companies do have an official policy so look at these and be prepared to tell your boss about them if they ask. Think about what the company will gain. Will you be learning a new skill or language that will benefit them? Will you be taking part in a project that will improve your leadership skills. Think of all the reasons why you should take a career break so that your company will be getting back a new and improved you. Rachel Morgan-Trimmer points out that career breaks can create better employees, and the company hasnt had to pay for it! "Make sure you put the business benefits to the employer." There are plenty of things you can do off season, and you may find it works out cheaper anyway! 5. If things are sticky, could you offer to work virtually? There are plenty of people who work from home nowadays, and that home could be a villa in the South of France or a beach in Thailand, so think about whether you could work virtually and still contribute. Become A Digital Nomad to find out more. 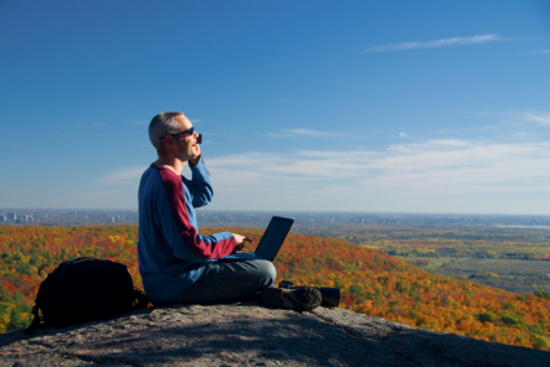 If your boss says no to a career break it could be an option to work virtually and still go travelling. Rachel Morgan-Trimmer recommends keeping in touch with work periodically, for you as much as your boss. She also suggests keeping up with industry news and gossip via the Internet. This keeps you in the loop and makes coming back less of a culture shock. If your boss is aware that you are still committed to a career in that area, and making plans to stay in contact, they may look upon it more favourably than if they thought you were disappearing off on a jaunt. What happens when you get your career break but your partner or spouse doesnt? There are plenty of stories of people who were granted their sabbatical, but their wives or husbands werent, and so had to forget about their grand plans and ended up spending three months doing the decorating. Think through who should ask their boss first, and what would happen if only one of you got your wish? Is there something you can do closer to home, or for a shorter time that would be a compromise? Or would the other person be prepared to give up their job so you can do this together? Or maybe you would just travel alone! Of course, you can always turn around and say you dont want it after all, but once you start planning and imaging all the exciting possibilities out there, this is quite a difficult thing to do! 8. What if your boss says no? Of course, not everyone gets what they want. Think about what you are going to do if you get refused your request. Are you so desperate for this that youll give your notice in anyway? Thats a big decision and needs to be considered carefully, especially in todays economic climate. Has your boss said you can go back at a future date and ask again? Is it worth waiting until then and trying again? Or is it just not the done thing in your business? "Think about what you are going to do if you get refused your request - just live with it for a few weeks and see how you feel. Dont make any quick decisions." Another alternative might be to get a job before you go, with a start date a month or two or even three in the future. This isn't going to fulfil any need for a long drawn out adventure but you may still be able to do something pretty exciting and still have a job to come back to, and thats not to be sniffed at. The most important thing to remember is that you dont have to do anything in a hurry. If the answer is no, just live with it for a few weeks and see how you feel. If, three weeks later, you still feel as though you absolutely have to get away, then it might be the time to think about your options. Dont make any quick decisions. If your boss agrees, get their acceptance in writing. Also, think through your daily activities in your job and create a how-to for each of them.